Russian President Vladimir Putin agreed to continue supplying gas to Hungary on Tuesday (17 February) during a visit to Budapest, cementing the EU member state’s growing ties to the Kremlin, as the rest of Europe distances itself from Moscow over its Ukraine policy. The fact Putin was in Hungary at all underlined the relationship. The Russian President has not been on a bilateral visit to a European Union country since June last year, just before a Malaysian airliner was shot down over a part of Ukraine held by Moscow-backed rebels. After several hours of talks, Putin and Hungarian Prime Minister Viktor Orbán said they had reached an agreement to extend a gas supply contract that expires this year. They said there were some technical issues to fix before it could be signed. Orbán said a big stumbling block, a clause in the expiring contract which means Hungary has to pay for gas it contracted to buy but did not use, had been resolved. He said Hungary can use the remaining gas under the contract in the coming years, and pay at the time when it draws on the gas. But he did not disclose the price it would have to pay. Gazprom is open to raising the amount of gas stored in Hungary, Putin said. The Hungarian prime minister also criticised those in Europe who want to isolate Russia – a stance that sets him apart many of his fellow EU leaders. ‘Turkish Stream’ to reach Hungary? Both Orbán and Putin said they would back a successor to the South Stream project, a gas pipeline that was to have pumped Russian gas under the Black Sea to southern Europe, but which Moscow has abandoned in the face of objections from Brussels. One option raised by both leaders was to expand ‘Turkish Stream’, a proposed Russian pipeline into Turkey, to include spurs that would take the gas through Greece and the Balkans to Hungary. “If they [the European Commission] don’t hinder us, then in essence we could realise part of the former South Stream project via Turkey,” Putin said. One of the aims of the ‘Turkish Stream’ project is to bypass Ukraine, and another, to punish Bulgaria, which Russia blames for having obstructed the construction of South Stream. 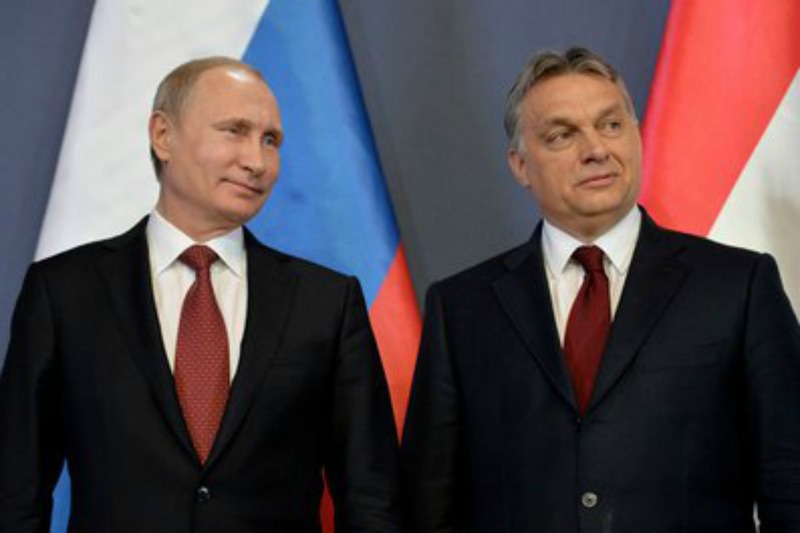 Orbán’s closeness to Russia has come at a political cost. Many Western diplomats say they are alarmed by what they see as Orbán’s drift into the Kremlin’s orbit. One of Orbán’s most important allies, business mogul Lajos Simicska, fell out with him this month, in part over his policy towards Russia, a source with knowledge of the matter told Reuters. In Budapest late on Monday, an estimated 1,000 people protested against Putin’s visit. Many Hungarians have expressed anger at the government's decision to expand the nuclear power plant without consulting the people. More and more often Hungarians demonstrate to remind Orbán of the country’s obligations as a member of EU and NATO. Perhaps Putin is a diplomatic genius and for some bi?zarre reason decided not to drag Orbán off a stage by a ‘handshake” in front of the world’s media?